The land trust movement is bigger than the earliest groups imagined, but the challenge the 250 Western groups face is even bigger, as development swallows the last open space. A glossary defines some of the real estate-style concepts behind land trust deals. Rondal Snodgrass of Sanctuary Forest describes how his land trust group has saved old growth in Northern California. Carla of the McDowell-Sonora Land Trust describes how her group tries to save land near Scottsdale, Ariz.
Lynne Sherrod of the Colo. Cattlemen's Agricultural Land Trust talks about how ranchers save open space. Rancher Jay Fetcher came up with the idea of a cattleman's land trust when his family began to look for ways to preserve their Yampa Valley lands. Wendy Fisher of Utah Open Lands talks about how her land trust group began in booming Park City. The Yampa Valley Beef Corp. seeks to protect land near Steamboat Springs, Colo., by selling locally raised beef in the area. Montana State Rep. Ben Cohen, environmentalist, garbageman, actor and outdoorsman, is mourned in Whitefish, Mont. The Glen Canyon Action Network plans a Restoration Celebration and Rendezvous at Utah's Glen Canyon Dam. A special investigative report by the San Jose (Calif.) Mercury News says public-lands grazing consumes dollars as well as grass. The League of Conservation Voters gives most Western congress people a poor grade on environmental issues. The Forest Service investigates Gloria Flora's charges of "anti-federal fervor" and employee harassment in Nevada. "Green Scissors 2000," a report by a coalition of environmental and taxpayer groups, cites 77 wasteful government programs. Lewis and Clark Bicentennial Training Academy offers courses for interpreters involved with tourism. Grand Teton National Park hosts a gathering to celebrate the legacy of the Muries, July 20-30. American Land Conservancy presents an Internet art show on-line, March 3-31. Colorado State University presents a High Altitude Revegetation Workshop, March 8-10. The Northwest Wilderness Conference, March 31-April 2, will feature David Brower and Polly Dyer as speakers. The Colorado Coalition of Land Trusts is sponsoring a spring conference in Golden, Colo., April 6-8. Prof. Debra Donahue's book, "The Western Range Revisited: Removing Livestock from Public Lands to Conserve Native Biodiversity," has infuriated Wyoming ranchers. USFS mulls changing vehicle color; Ariz. couch potatoes slim; Idaho's potato supremacy threatened; San Francisco battles rodeos; Tom Forsythe told to quit photographing Barbie dolls; Aspen fights monster homes; faux fish trophies; what animal? Dam-breaching correction; HCN's Robert Hayutin and Three Rivers Land Trust; HCN is 30; Peggy Rawlins. At the University of Wyoming, Prof. Debra Donahue's book, "The Western Range Revisited," with its criticism of grazing, has provoked fury among ranchers and raised questions about academic freedom. Babbitt plans "national landscape monuments"; Phoenix air pollution; Animas-La Plata rises again; Las Vegas Mayor Oscar Goodman's ideas on storing nuclear waste; lawsuit over Makah Indians' right to hunt gray whales. Ashland, Ore., rallies to defend consensus-building Forest Service District Ranger Linda Duffy, when she is unexpectedly demoted and reassigned. Jack and Stephanie McFarland sue when Glacier National Park officials deny them a special permit to snowmobile into their park inholding. In Washington's Methow Valley, hunters deliver roadkilled deer to six tribes in an agreement in which the tribe agrees to stop hunting in the valley. What to do about "Frankenfoods'? Two natural-foods chains - Wild Oats Market and Whole Foods Market - are banning genetically engineered foods from their stores. San Juan County, Utah, officials are removing "road closed" signs from BLM land in the Grand Gulch area, claiming ownership of the roads. The Fish and Wildlife Service agrees that the black-tailed prairie dog needs protection but decides not to list it as endangered yet. The Army Corps of Engineers is trying to figure out how to relocate the 10,000 pairs of Caspian terns nesting on Rice Island at the mouth of the Columbia - and eating millions of young salmon. 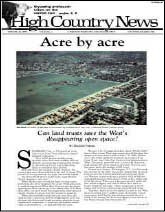 High Country News celebrates its 30 years by looking back at the paper's early days in Lander, Wyo. Quotes from High Country News' founding father, Tom Bell, show his passion about preserving the West. A University of Wyoming faculty member says that the furor over Debra Donahue's book, "The Western Range Revisited," is just the most recent attack on academic freedom led by Wyoming special interests. Prof. Debra Donahue defends her controversial book, "The Western Range Revisited," and its criticism of public-lands grazing.